More than 250 alumni, faculty, staff and friends gathered April 20 to celebrate the Arkansas Academy of Civil Engineering's annual induction and awards ceremony. The Academy welcomed 13 new members, and three undergraduates were recognized for their achievements. The Academy exists to recognize civil engineering graduates who have made significant contributions to the civil engineering profession. 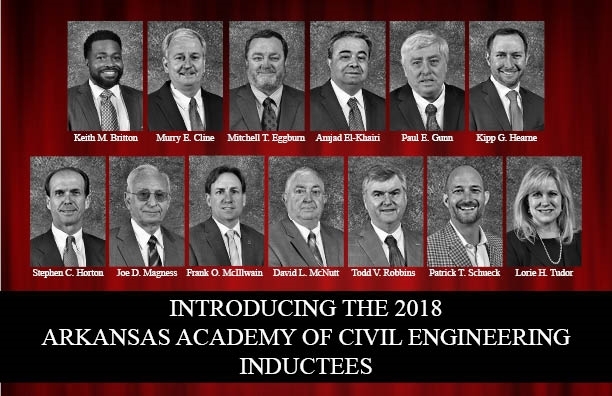 Members support the efforts of the University of Arkansas' Department of Civil Engineering to educate and graduate the next generation of civil engineers who will be expected to continue upholding the high ethics and standards of the profession. The ceremony also included recognition of three outstanding students in the department, who were voted on by the faculty. Sarah Hernandez, assistant professor, awarded the outstanding sophomore award to Anna Claire Hunter. The outstanding junior award went to Rachel Pohl, awarded by Micah Hale, professor and department head, and Vanessa LeBow received the E. Walt LeFevre Outstanding Senior award, awarded by Assistant Professor Michelle Bernhardt-Barry. The Business Meeting was held the following morning in the John A. White Engineering Hall where members made new pledges for providing scholarships for the upcoming academic year totaling more than $85,000. The AACE Events for 2019 have been scheduled for April 12-13.